Medicare Plan G is the second most popular Medicare Supplement plan in 2019. This is due to it covering almost all the gaps in coverage. As you probably know, Medicare Part A and B don’t pay all your healthcare costs – you’re still responsible for co-pays, deductibles, and coinsurance. However, if you have Medigap Plan G, virtually all of those costs will be paid for. Medicare Supplement Plan G offers many benefits beyond what you get with Medicare insurance alone. If you’re okay with paying a small annual deductible, the rest of your gaps in coverage will be billed to your supplement carrier. Plan G is very similar to Plan F, with the only difference being that it doesn’t cover the Part B deductible. The annual outpatient deductible is $185 in 2019. Anything that Original Medicare covers, Plan G will also cover, minus the outpatient deductible. It covers your inpatient hospital costs, as well as outpatient. Medical services that fall under outpatient include lab work, x-rays, exams, surgeries, durable medicare equipment, etc. If you are enrolled in Part B, you can apply for Medigap Plan G. If you enroll during your Medigap Open Enrollment Period, which is the six-month period that begins the first month you are at least 65 and enrolled in Part B, you’re guaranteed to be accepted. Any pre-existing health issues won’t be a determining factor in the amount of your premium. Nor will it impact you getting accepted into the plan. You can apply for Plan G at any time outside your OEP window. However, insurance companies will take your overall health into account in deciding whether to accept you and how high your premium will be. For those beneficiaries only enrolled in Original Medicare, without Medicare Supplement insurance, being responsible for 20% of your medical costs could leave you financially vulnerable. For example, let’s say Roger ended up in the hospital due to an illness. That illness left him in the hospital for a few weeks, as well as multiple follow up visits and tests with his primary physician. Part A pays his hospital expenses, but still leaves him with a deductible of $1,364. Then Part B pays for the follow-up visits with his primary, minus the Part B deductible and 20% left over after Medicare insurance pays their share. His follow up doctors visits and tests had a total cost of $30,000, he’s left responsible for 20% of that. Leaving his total out of pocket costs to be $4,000 + the inpatient deductible for $1,364 + the outpatient deductible of $185. The above example is using a minor illness, a serious illness could be financially disastrous. In the end, the only costs for Plan G are the monthly premium and your outpatient deductible. Medicare Plan G premiums vary and are determined based off multiple factors. The premium could be more in one state than it is in another. The overall average monthly premium is around $110. Again, we’ve seen it cost less as well as more for each individual beneficiary. You can enroll in Plan G over the phone or online, and the process is relatively simple. With technology, you no longer have to track down a local agent and schedule an in-person meeting to enroll. The best way to handle it is to work with a licensed agent that can search for the best rates from top insurance companies and help you through the enrollment process. Each carrier will offer different plans in different states. Just because one carrier offers Plan G in one state does not mean they also offer it in another. 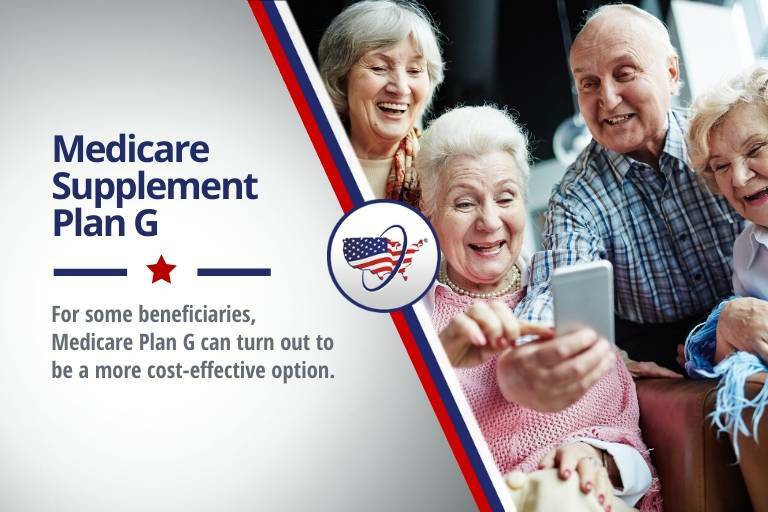 The majority of your well-known carriers offer Plan G since it’s one of the most popular plans among Medicare beneficiaries today. However, going with a well-known carrier may not get you the lowest premium. That’s why it’s important to speak to an agent that can compare all Plan G rates with all carriers, and not just the big named ones. Regardless of the carrier you choose, Medicare Supplement Plan G benefits will be the same. They’re standardized by the government. The only difference between carriers is the premium they charge for that letter plan in that specific state. Some states require insurance companies to make Medicare Supplement insurance policies available to people under 65 and disabled. If policies are offered in your state, your choices may be limited. Coverage for people under 65 is typically much more expensive than it is for people who aged in. Does Medicare Plan G Cover Prescriptions? No, Medicare Plan G does not cover prescriptions. No Medicare Supplement insurance plan covers prescriptions. Most beneficiaries who have Original Medicare with a Medicare Supplement plan will enroll in a stand-alone Part D prescription drug plan to cover the cost of their prescriptions. The good thing with Part D is most beneficiaries find the plans very affordable. Some Advantage plans will cover prescriptions, but like everything else with these types of plans, there are many restrictions. 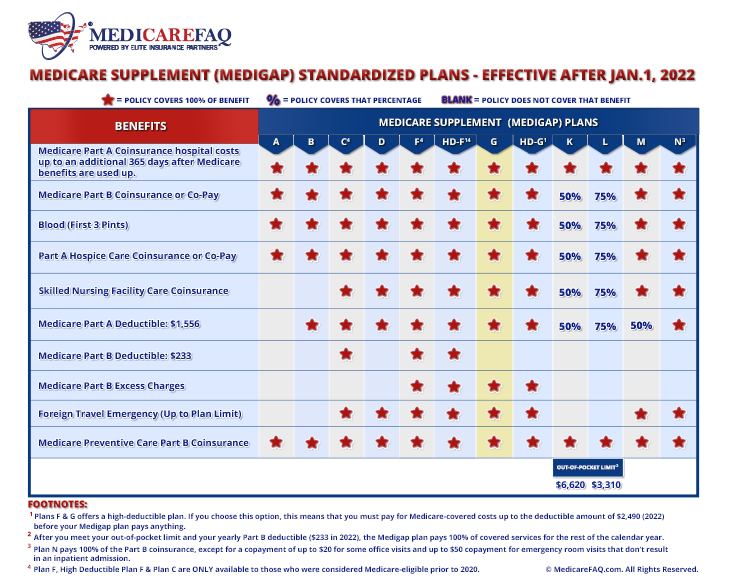 Is Aetna Medicare Supplement Plan G offered? Aetna is one of many well-known insurance companies that offer Medicare Supplement Plans, including Plan G.
All Medicare Supplement plans are standardized. Plan G with Aetna will have the same benefits as it does with any other carrier. Since insurance companies set their own premiums, that means that Aetna’s Plan G may cost more or less than a competing insurance company’s Plan G.
Which is the best option between Plan F & G? Plan F offers slightly better benefits, but Plan G usually has a better price. The only difference between the two, benefit-wise, is that Plan F pays the annual deductible for Medicare Part B. However, starting in 2020 all first-dollar coverage plans are being discontinued, including Plan F & Plan C. As long as you become Medicare eligible prior to 2020, you can still enroll into one of these first-dollar coverage plans after they’ve been discontinued. Is Medicare Advantage a good alternative to Plan G? When you choose to enroll in an Advantage plan, you’re giving up your Original Medicare benefits. You also can not enroll in a Medicare Supplement plan, including Plan G. Many limitations come with Advantage Plans, including restrictions on in-network doctors. The majority of our clients end up disenrolling from their advantage plan and going back to Original Medicare due to all the restrictions. Medicare is even bringing back a specific enrollment period just for Medicare Advantage enrollees due to the number of beneficiaries who ended up stuck with a plan they didn’t want. The old saying “you get what you pay for” comes into play with advantage plans. Zero dollar premiums are not all that the commercials make them out to be. When applying for Medicare Supplement Plan G coverage, it pays to be well-informed. MedicareFAQ will get quotes for you, free of charge, and help you understand pricing and benefits before you sign up. Contact us to get a rate analysis of all the carriers that offer this plan in your area. Plus, if you enroll in a supplemental plan through us, you’ll receive unlimited support from our Client Care Team. Get started today by calling the number above or filling out our online quote form.